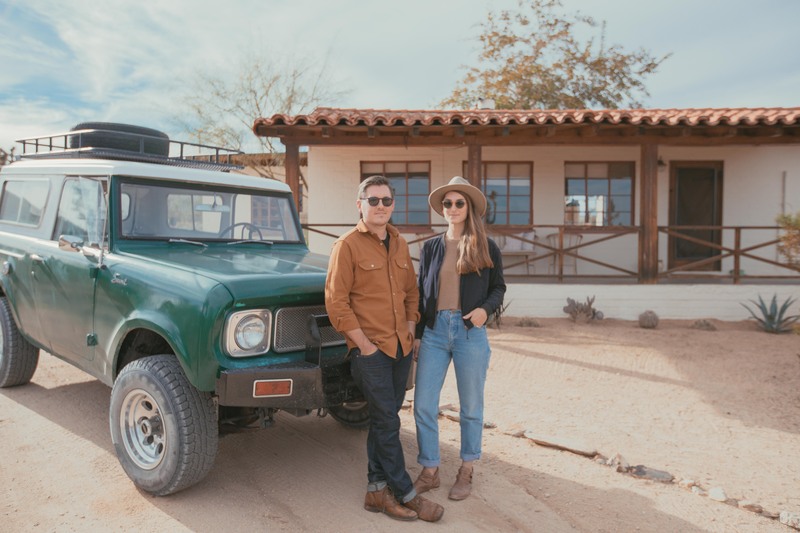 For Sara and Rich Combs, a love affair with Joshua Tree all began with a month-long cross-country road trip. The couple had been living and working in San Francisco, both as web designers. After traversing National Parks across the country on their trek, they made their first trip ever to Joshua Tree National Park. Something about the wide open desert, the even wider night sky, and the quirky creative community spoke to them. 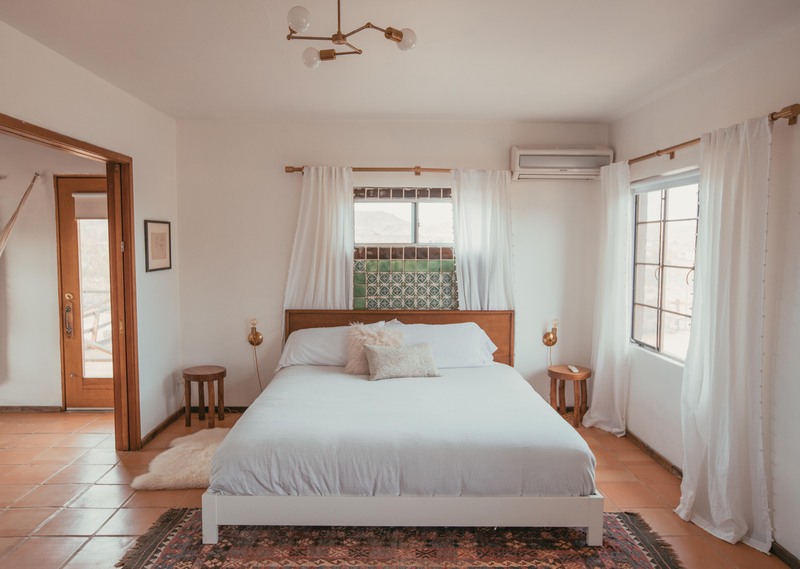 They stayed in an Airbnb for one night, and decided they wanted to find their own home like it. Exactly one year later, Sara and Rich found a historic dream home. 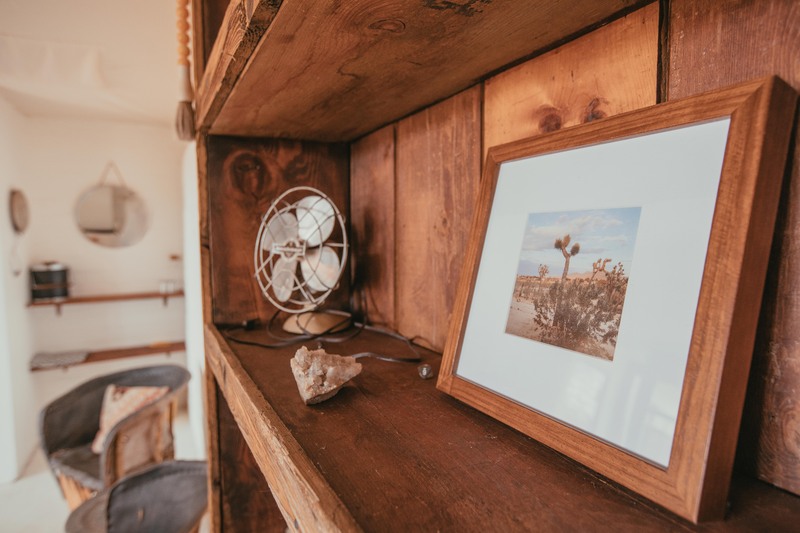 Judging on the amount of social media love The Joshua Tree House gets, the couple is accomplishing just that. 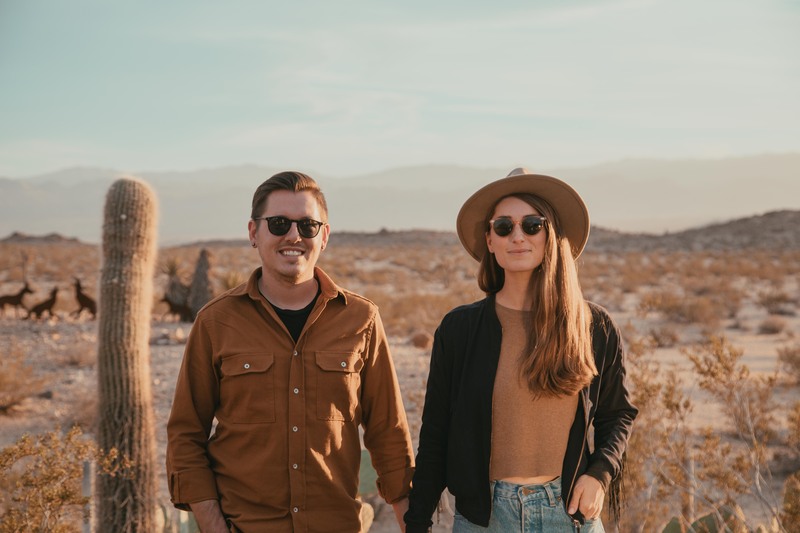 This past year, they moved full-time to Joshua Tree to invest in the creative community here and also work on a new house project. 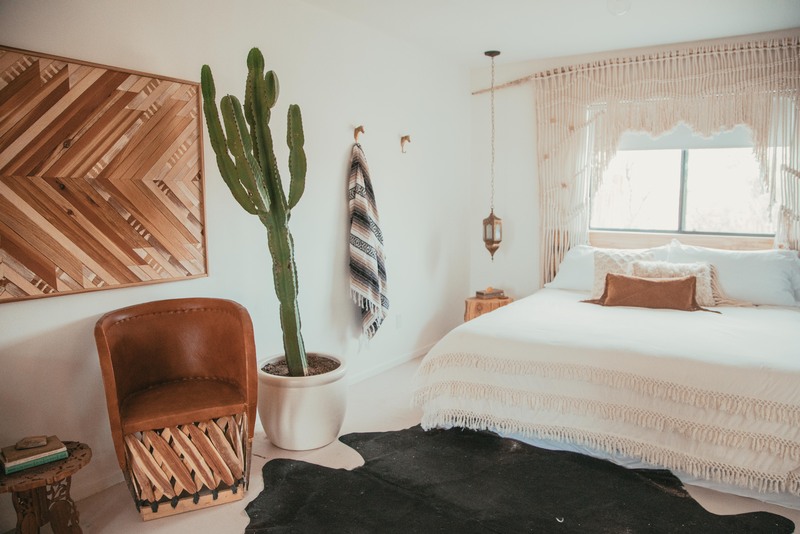 We caught up with Sara and Rich as they were putting the finishing touches on their second pet project, the Joshua Tree Casita. What inspired you to start hosting? RICH: My dad and grandfather used to share so many amazing stories of the inn that their family used to have in Connecticut. They had great memories of hosting people there, so I always had this interest in hospitality. Sara and I both have a passion for interior design and love creating experiences for people as designers, so the house was a great project for us. Hosting on Airbnb just felt like a natural extension of all of this. SARA: We also loved the idea that hosting gave us the flexibility to go back and forth between here and San Francisco, where we were still working with clients in the city. But over time, we ended up spending more time down here, so we recently made the move to make this our permanent home. Tell us about the Casita. RICH: It’s been quite the process making it the amazing space it is now. It was built in 1958 but it had been renovatd in the 90’s so it was a bit outdated to say the least. Everything was faux finished and there were a lot of extra walls and closets that we knocked down. Legend has it, one of the members of Echo and the Bunnymen used it as their recording studio. The gardens on the ground are dreamy but a lot of it was overgrown which meant more work for us. Both houses are just gorgeous. How would you describe your style and how it’s influenced by the area? RICH: We really let the house guide the style, so it’s more rustic than we typically were used to. But I think we’ve learned to love that a lot. Our style is more modern, so it became a modern rustic blend. We bought a lot of things in local shops — there are so many great vintage stores in Joshua Tree. Even the books we bought are all California and desert related. We put a big focus on celebrating the area and a southwestern feeling. SARA: One thing we really wanted was a space that creative people could come in and feel inspired by. We collaborate with artists who inspire us—who come and stay here and create— and hopefully that inspiration goes forward to our guests. 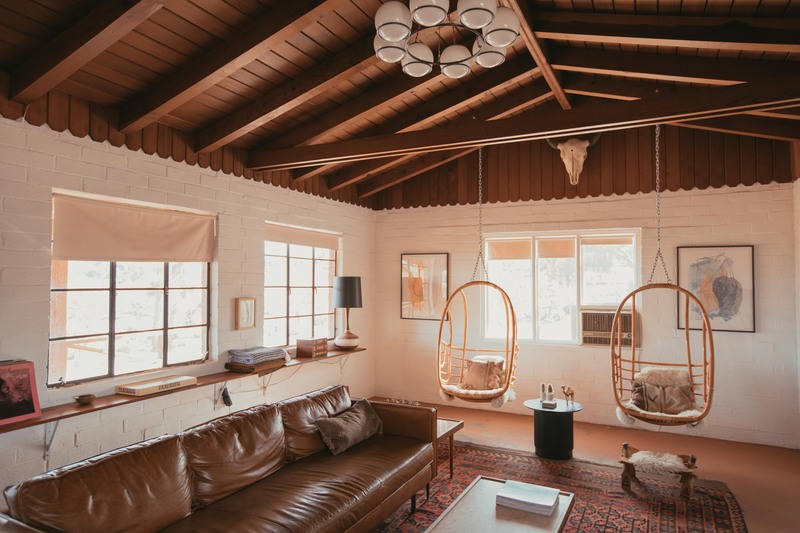 Our friend Heather Day created the two pieces behind the hanging chairs in our main living space. We love to collaborate with people who inspire us, and hopefully that sentiment is shared with our guests. How does your experience as designers influence your role as hosts? RICH: We are always aiming to create an experience for people. We do that with websites and apps. Now, with hosting, we do that in the tactile world. We’re always thinking, “How do we make the best experience possible? 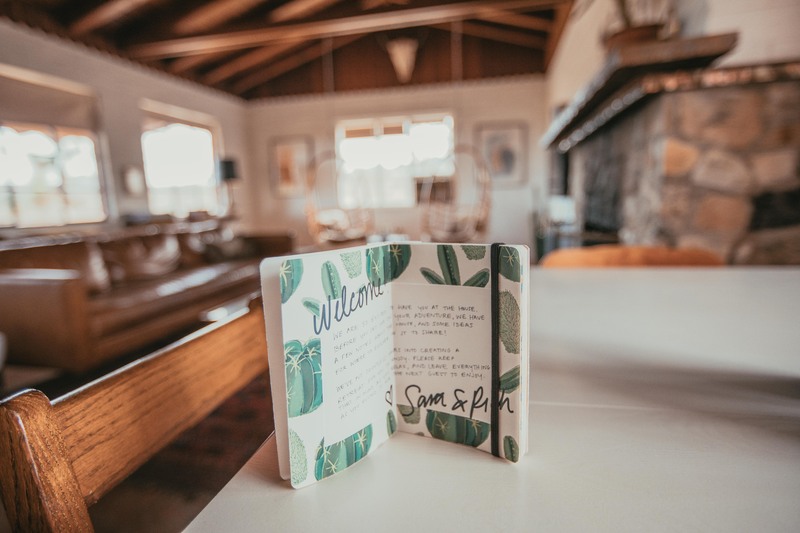 When you walk in, what’s the first thing you see?” For example, a lot of hosts do binders with laminated sheets of recommendations for their guests. 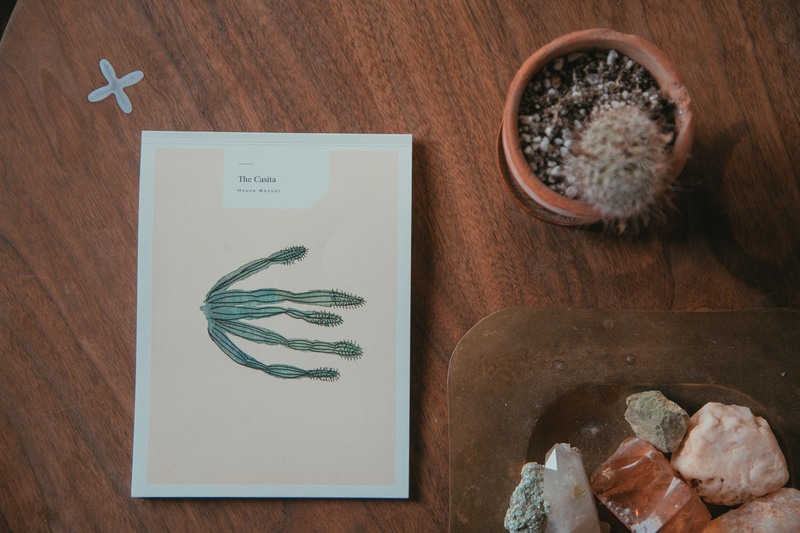 Which is great, but we wanted to make that experience more fun, so Sara illustrated a little book about the house and our recommendations for the area. That sits next to the record player, so you can sit down and turn on some music and introduce yourself to the space in a memorable way. SARA: There is something more rewarding to creating this overall experience for people rather than on websites. Online, it’s a temporary experience. Everything is so iterative, and in six months, the design could be outdated or there is a new company objective. It’s constantly changing. With this, we feel we’re able to create something that’s more memorable, more tactile. We really love seeing that we’ve designed an experience people will remember forever. Are there any pieces in the house that have some great stories behind them? 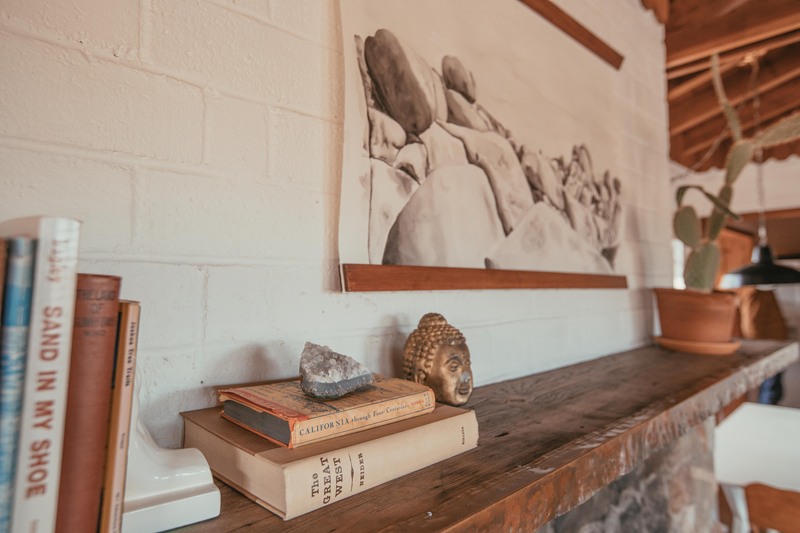 SARA: Above the mantle, Rich painted one of our favorite Joshua Tree views — that was something we wanted to do from beginning. It was the last finishing touches before we listed the space on Airbnb. RICH: Another thing we want to do with house is have it tell more of a story. How could it influence an artist or anyone staying here for a longer period of time? So we decided to create an artist residency program. It’s something my family’s place in Connecticut always did—working with artists to create paintings for the inn for their advertisements. We wanted to work with the local artist community here in that way, too. What are you most proud of in the new home? RICH: There are so many amazing details in this space. The ceilings were gorgeous, and the floors were worn in this wonderful way. So we wanted to simplify the space so that these things could shine. There was a lot going on originally and they were all covering each other, so we were proud of letting the house and its natural beauty come through. SARA: We also have created the tent room. It’s attached to the house but it opens from the exterior. We put canvas over the ceiling to make it feel more like a tent which adds a “glamping” feel to it. A lot of people come to Joshua Tree to camp, but this feels like a super unique way to do that. How do you personally define the idea of home? SARA: We like to think it is the idea of having a lot about the people around you. 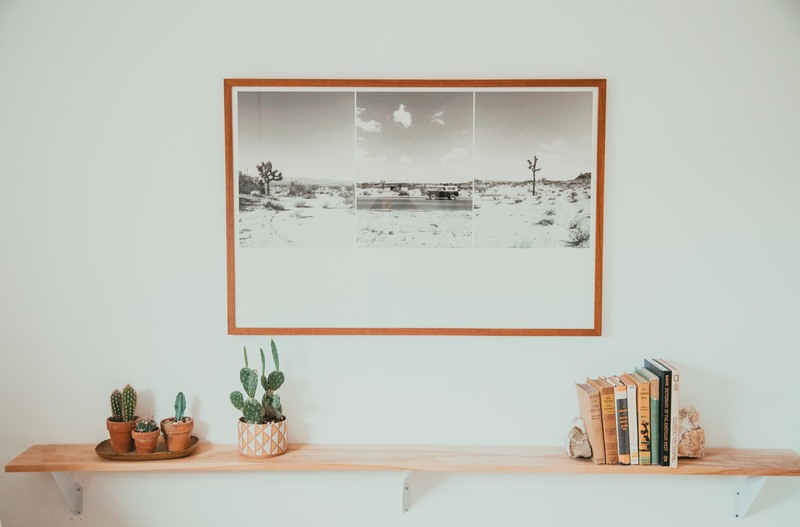 We never really thought that Joshua Tree would be home, but we quickly realized that there is this awesome community here and it ended up feeling like home because of that. Everyone here seems very creative and inspiring, so we can feel at home. RICH: We spent about two years in a nomadic lifestyle. We were in San Francisco for seven and a half. So now there is this certain Joshua Tree energy in the air that makes us feel creative and at home here. My mom was asking this question about the idea of home; their generation is all about settling down in one spot and that becomes home. But as we were staying in different homes, we realized that, as long as we’re with each other, we’re happy. Home could be anywhere. We just need that community to relate to and support… and each other.